Most people associate orthodontics with young teenagers whose teeth are covered by a latticework of metal. There are many orthodontic patients who fit that description and wear braces as a form of orthodontic treatment. However, there now exists an increasingly popular alternative to traditional metal braces: Invisalign® clear aligners. 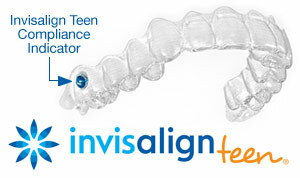 As the name implies, Invisalign clear aligners are made of almost invisible polyurethane plastic. Rather than being cemented or bonded to the teeth as metal or clear braces are, clear aligners are completely removable, for important social occasions, for eating, and, most importantly, for tooth-brushing and flossing. However, you must resist the temptation to take your aligners out more than is advised. A Discreet Look — If you consider your orthodontic treatment to be a private matter, or simply feel that metal braces don't fit with your self-image, the practically invisible form of Invisalign orthodontic treatment might suit you. More Dietary Choices — To protect metal wires and braces, some diet modifications are necessary to avoid certain foods that can damage your orthodontic appliances. With Invisalign clear aligners, you can still bite into an apple or a crispy pizza crust once you have removed your clear aligners to eat. Comfort — The soft, flexible material of Invisalign aligners will not irritate the soft tissues of the mouth, like metal wires and braces can. Teeth-Grinding Protection — If you have a teeth-grinding or clenching habit, Invisalign clear aligners can function as thin nightguards that will protect your teeth from excessive wear. Invisalign clear aligners work the same way traditional braces do: by applying carefully controlled forces to teeth to move them into a better position. The difference is that they are not made of metal; instead, they are made of clear, flexible plastic. 1. Specialized computer software helps Dr. Weis and Dr. Varner, your Charlottesville orthodontists, design a plan for moving your teeth from their current positions into the best possible alignment. 2. This movement will be broken down into about several dozen stages. For each stage, the Invisalign company will manufacture two plastic mouth “trays” or “aligners,” one to fit over your top teeth and one for the bottom. Invisalign can also be used as a form of orthodontic treatment for teenagers. For the teen who wants a more discreet form of orthodontic treatment that offers comfort and more flexibility, Invisalign Teen is specially designed with teenage patients in mind. Special “eruption tabs” that hold the appropriate amount of space open for molars that have not fully grown in. “Compliance indicators” built into the aligner material, which fade with wear and allows parents, orthodontists, and the patient themselves, to make sure the clear aligners are being worn as prescribed for successful orthodontic treatment. Brush your teeth after every meal or snack so that food and plaque do not get trapped in the Invisalign aligners, which could promote tooth decay and gum disease. Clean your aligners regularly by brushing them and then rinsing them with lukewarm water. Wear your retainer(s) exactly as prescribed by Dr. Weis and Dr. Varner after your Invisalign treatment is completed to maintain your post-treatment results and protect your investment in a beautiful new smile. Invisalign clear aligner technology has been improving over the years and can correct many malocclusions (misaligned bites) that once would have been too complicated for this form of orthodontic treatment. There are still some orthodontic situations for which traditional braces would still be best, but our team would be happy to discuss this in detail with you. Contact one of three offices located in downtown Charlottesville, Spring Creek, and Hollymead if you have any questions about Invisalign or would like to request a free consultation to determine if you are a candidate for Invisalign. We look forward to hearing from you and improving your smile!